The Certificate of Excellence was presented by Mal McLaren P.E., Trustee of the Foundation for Engineering Education (FEE) and by Rudi O. Sherbansky P.E., New York City’s Regional Vice President of NYSSPE and Chair-elect of the PE’s in Construction Group of the National Society of Professional Engineers (NSPE). 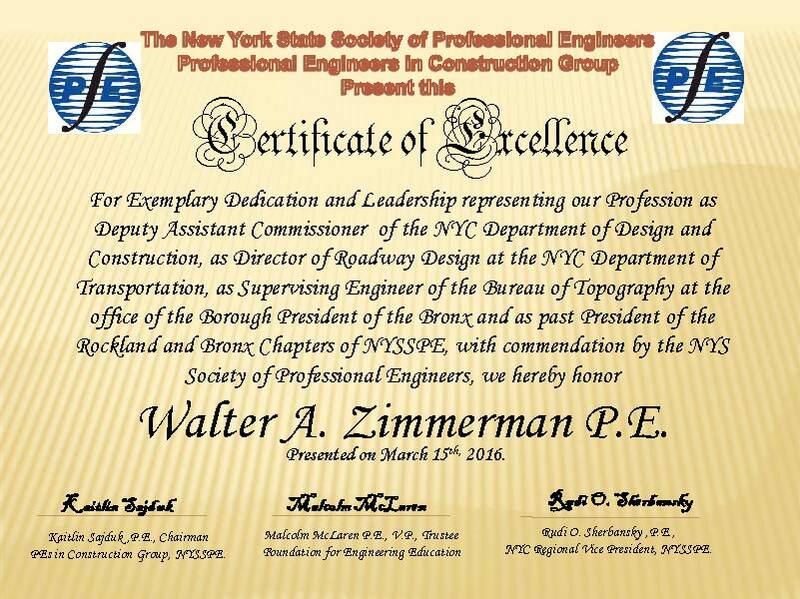 The Certificate which is issued annually by NYSSPE’s Professional Engineers in Construction Group (PEC) to distinguished members of the engineering society, was also endorsed by the Chair of PEC, Kaitlin Sajduk P.E. and presented to Mr. Zimmerman on March 15, 2016. As Deputy Assistant Commissioner of the NYC Department of Design and Construction (1996 – 2002), Mr. Zimmerman developed design schedules for in-house capital projects; represented the department at meetings involving City and State agencies, community boards, private companies, etc., regarding policies and programs; performed review of capital projects for completeness; maintained training manuals for the design of highway projects; prepared the Street Design Procedures Manual and periodically gave training courses to new engineers; assisted new engineers on a one-to-one basis to develop, layout and estimate capital projects; prepared traffic detours for construction, street realignments; answered utility and community concerns. As Director of Roadway Design at the NYC Department of Transportation (1990 – 1996), Mr. Zimmerman reviewed consultant work, set standards and monitored design projects; acted as hearing officer for DOT’s EDPI; represented DOT to public, community boards and other agencies; prepared legal documents relating to acquisition and advised Law Department on engineering matters; Mr. Zimmerman also assisted the Bureau of Bridges in setting up and training a specialized section of bridge design engineers in the mapping and acquisition of property and easements for various bridge projects, as well as generated reports and documents for specific assigned projects. At the NYC DOT’s Department of Highway Operations (1977 – 1990), Mr. Zimmerman was in charge of two design sections and coordinated consultant programs, reviewed work, set standards and monitored section engineers; he prepared acquisitions, grade changes and re-mapping in the City, as well as prepared specific project reports and studies. Mr. Zimmerman was a designated DOT Hearing Officer; trained DOT personnel on a one-to-one basis; worked on standardization and DOT directives; represented DOT to public, community boards and other agencies; supervised preliminary design, as well as unified contract drawings, specifications and estimating from five different NYC borough criteria. Mr. Zimmerman graduated with a Bachelor of Science in Civil Engineering from the City College of New York and obtained a Master’s in Civil Engineering from the City University of New York. He received his professional registration of a New York State Professional Engineer in 1962. The New York State Society of Professional Engineers (NYSSPE) is an organization consisting of engineering professionals from all disciplines and employment sectors that advocates licensure, promotes the ethical, competent and lawful practice of engineering, and enhances the image and interests of its members and the engineering profession. NYSSPE represents professional engineers (totaling more than 25,000 licensees in New York State) practicing in all disciplines (civil, structural, mechanical, electrical, geotechnical, environmental, etc) and practicing in all practice settings (private sector consulting, industry, government, and education). Note: NYSSPE facilitates posting on this news blog, but the views and accounts expressed herein are those of the author(s) and not the views or accounts of NYSSPE, its officers or directors whose views and accounts may or may not be similar or identical. NYSSPE, its officers and directors do not express any opinion regarding any product or service by virtue of reference to such product or service in this blog.